Place powdered creamer and coffee granules in a tall microwave-safe mug or glass. Add 3/4 cup very hot water, and stir until dissolved. Add soymilk, and microwave until drink is hot, about 45 seconds. Stir in chopped white chocolate chips, and enjoy! HG Alternative: You can add the chopped chips with the creamer and coffee granules, but we like 'em best when they're stirred in at the end! 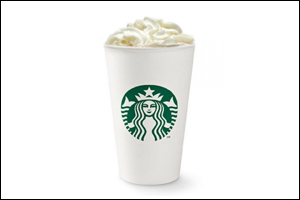 We'll confess -- any time Starbucks releases a new coffee drink, we pretty much immediately get the urge to try it and give it a guilt-free makeover. Not only is this more cost effective than trips to the coffee shop, but it's also the best way to keep calorie counts under control. This one isn't new, but it recently caught our attention. Good thing, 'cuz look at the numbers below. Fifteen grams of fat? That's like four slices of pork bacon. Forty-six grams of sugar? That's almost 1/4 cup of granulated sugar! 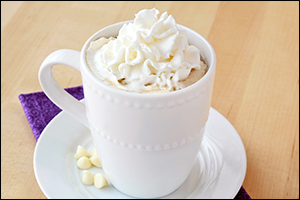 For our lightened-up swap, we kept things sweet 'n creamy with light vanilla soymilk and sugar-free vanilla creamer. Instant coffee, white chocolate chips, and (optional) fat-free whipped topping sealed the deal! So squash those white-chocolate-coffee cravings in an instant, without the fatty, sugary calorie overload. Tell your coffee-break buddies you've got a new recipe to try -- click "Send to a Friend" now! January is National Carrot Month. It's also Frequently Really Cold Month (unofficially). This Creamy Carrot Soup is just the thing you need!